When you’re running a business, your printer is often one of the most important pieces of equipment that you have. Sure, we may be entering the age of the digital office. But there’s still no suitable replacement for hard-copy documents. For many businesses, 8.5″ x 11″ paper just doesn’t cut it. Proposals, presentations, and technical documentation simply look better on larger sheets of paper. But how can you reliably print such large documents? The answer is a wide-format printer. 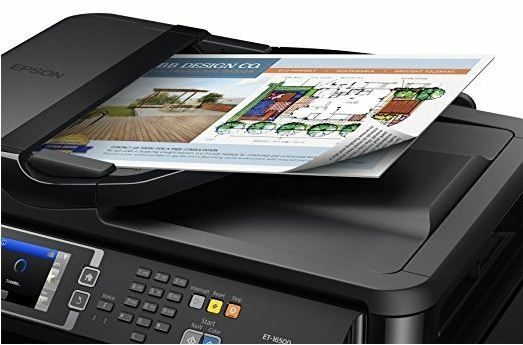 These printers are capable of producing pages up to 11″ x 17″ and 13″ x 19″, and often much more inexpensively than printers that are designed to be used primarily with smaller paper sizes. When you’re on the hunt for a wide format printer, you’re going to want to find something that is both efficient, but still produces high quality results. It can be hard to find one that meets your needs, so we’ve gone through and found the best wide format printers that you can own today. Let’s take a look and find out which one is right for your needs. No other company is more familiar with business needs than HP. From laptops to desktops, they produce a large range of computers and all of the accessories that go with them. For low to medium volume printers, the OfficeJet Pro 7740 is an excellent choice. 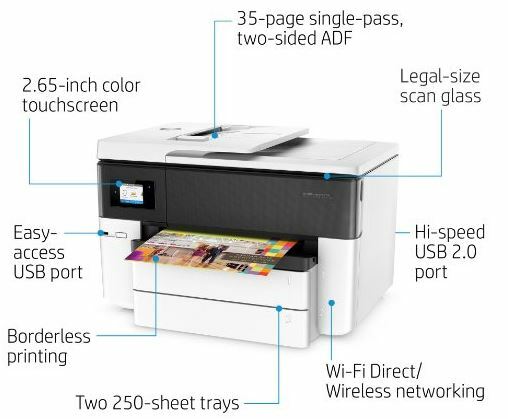 The HP Officejet Pro 7740 has a plethora of both wired and wireless printing options. If you want to keep it simple, you can easily connect it with a USB cable and print directly from any single computer. But once you hook it up to the network, it becomes the powerful office printer you’ve always wanted. It’s got a built-in print server, so with a little setup adding the printer to your networked computers can be as easy as typing in an IP address. Alternately, you can use the included setup CD to walk you through this process. Network printing works the same over both wired and wireless networks. With the simple touchscreen interface, you can quickly connect to your wireless network and enter the password. Once online, you’re able to use any standard printing software, or HPs simple Wi-Fi direct solution. But you aren’t tethered to proprietary software, as both Apple AirPrint and Google Cloud Print are both supported. 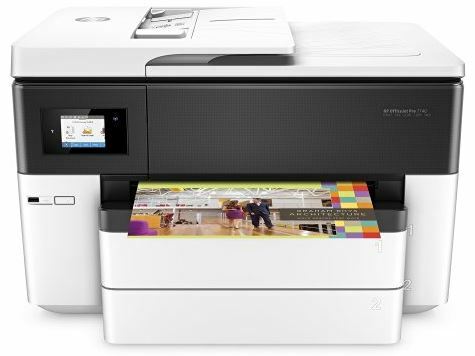 The HP 7740 is the perfect printer for office use. It’s got a much higher DPI than competitors, and produces nice clear, evenly colored prints that look fantastic. The first thing that we noticed was that text looks well above average. This is because it’s capable of using both the black and the color cartridges at the same time. Some printers make black by blending all of the colors together, giving it a faded look. But this one keeps text looking crisp, while still producing vibrant diagrams and backgrounds. Photo printing wasn’t quite what you’d get from a photo-specific printer, but still looks great for the occasional photo. For low to medium volume businesses, it offers surprisingly decent rates. It’s much more conservative with its ink use than many other competing models. In black and white, print costs average 2 cents per page. Color sheets come out at around 8 cents a page. Of course, these rates will be lower if you’re printing on standard 8.5″ x 11″ sheets, but for medium format prints you’re still getting very good value. 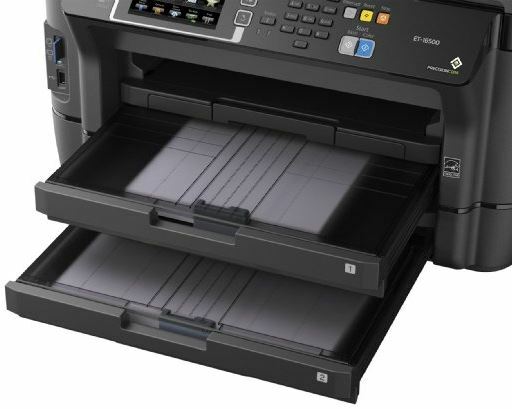 The Officejet Pro 7740 is recommended for businesses that print 200 to 1500 sheets per month. If you’re printing text, black and white pages will be produced at a shocking 23 pages per minute, while color prints are produced at 10 pages per minute. The printer also has a full duplexer, so you can print double sided pages without having to manually flip the sheets. You get much more than just a printer with the 7740. You’ve also got a flatbed scanner, copier, and a fax machine. It can hold up to 500 pages in any size from 3″ x 5″ to 11″ x 17″, making this a truly versatile printer that can handle anything you throw at it. 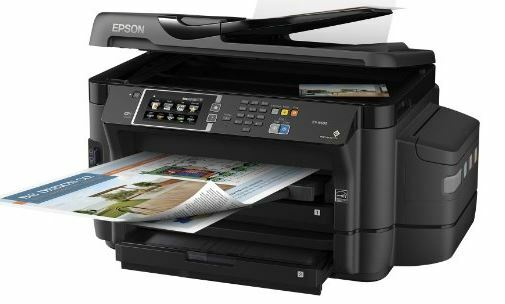 Epson is one of the most well-known brands when it comes to printers. Their products lean towards consumers who want quality above all else. This printer is a stand-alone model, meaning it doesn’t include some of the features you’d get with an all-in-one unit. However, it offers better quality than anything else on the market, making this the first choice for consumers who demand the best. 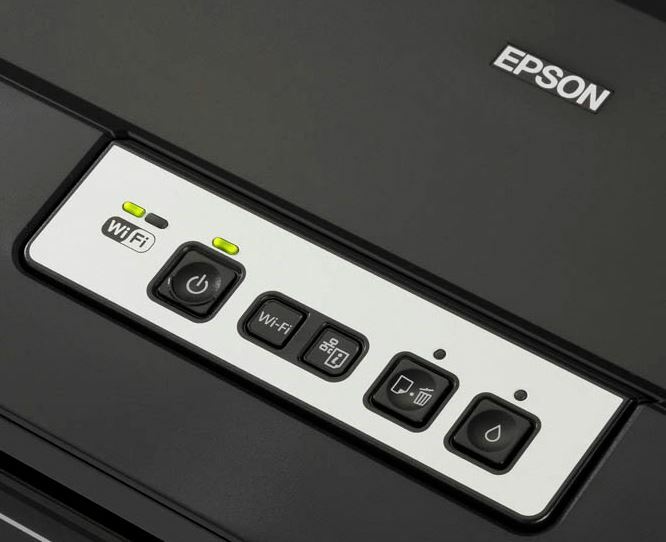 Epson keeps things simple with the Artisan 1430, providing you with wired or wireless connectivity options. There’s no LCD display on the front panel, so the setup is all configured from the included software. It only takes about 5 minutes, and can be completed with anyone regardless of their technical skill. You are going to need the Epson specific driver installed. 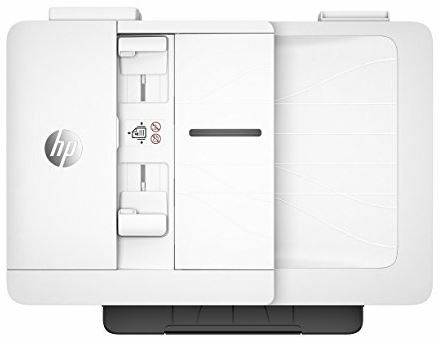 Technically, the printer will work with a standard print server, but unless you have the driver you won’t be able to take advantage of the high-quality features offered. For this reason, it’s best used with computers, instead of mobile devices. 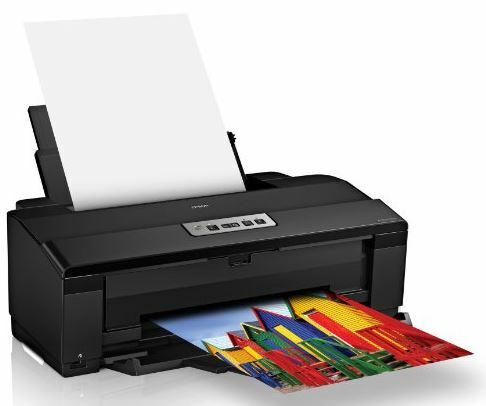 This is one of the highest quality wide format printers you can buy. There are two types of inkjet printers on the market. There are dye based printers, and pigment based printers. This is one of the few dye based printers. This gives you a few key advantages. First, color is much more vibrant and realistic than pigment inks. It can be used with a larger variety of paper types, with the print heads specially calibrated for each type. These dye based inks are perfect for photo printing, offering lab-grade color reproduction. If you want your documents to last a long time, you’ll certainly appreciate the dye based inks. They’re designed to hold their image for up to 200 years when properly stored, or 98 years when on display. With a resolution of 5670 x 1440, the Artisan 1430 produces sharper, clearer images than any other wide format on the market. Dye based inks are a little more expensive, so fortunately Epson has divided up the cartridges to prevent you from spending any money unnecessarily. You’ve got a total of six cartridges, each of which are included with the printer. They come in yellow, black, cyan, magenta, light cyan, and light magenta. Large format, full color prints will cost you about 20 cents each. This is assuming that all colors are used equally, so you’ll probably find that your actual cost is much less than that. In general, the printer is supposed to be able to produce 810 pages of full color printing per set of cartridges. This may not seem like the cheapest printer on the market, but you’d easily pay 10x this amount if you were having them done professionally. The number of prints you can make at once time depend heavily on what type of paper you use. Epsons high-grade glossy photo paper is quite thick, allowing for a maximum of 10 sheets in the hopper. Alternately, you load 50 sheets of standard inkjet paper. The holder is also designed to accept ID cards or CDs, printing them one at a time. As for the speed, that depends heavily on how high quality you want your images. “Best Photo” produces lab-grade images, but takes over seven minutes to complete. The same image in “high speed photo” mode only takes 1 minute and 44 seconds. Obviously, this is not the fastest printer on the market. But you’ll never find a high-quality dye-based printer that can produce prints any faster. Epson’s included photo editing software provides you with an easy way to get your prints exactly the way you want them. You’ll be able to choose the size, color correct them, apply the right color-space, and control every aspect of your print. Where most printers restrict you in size, this one allows for up to 13″ x 19″ prints with absolutely no border. This is a true edge to edge printer, something that professionals will be looking for. Although their last printer was focused heavily at photographers or businesses who want to make professional grade prints, this one is focused more on high volume customers. It’s not often high volume users would consider an inkjet printer, but you’ll certainly want to give this one a look. 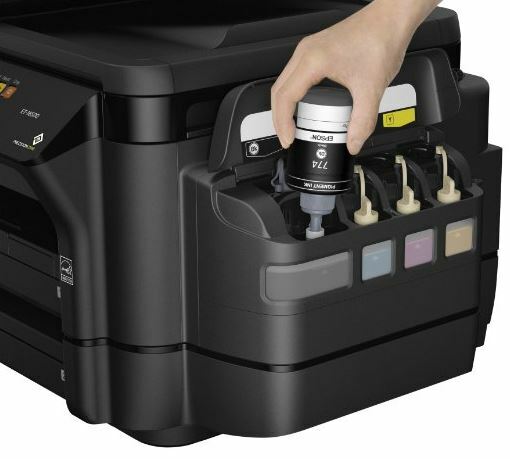 The Epson ET-16500 EcoTank is a printer that you truly can connect to anything. You’ll want to connect it to your network, either through an Ethernet port or over Wi-Fi. Setup is simple, just requiring a couple quick entries on the large touchscreen at the face of the printer. After that, you can quickly add it to any networked device you like. It supports all cloud printing services, giving you unparalleled compatibility. One of the areas that the ET-16500 shines is in print quality. It’s much less conservative with ink, ensuring that your images look crisp, even, and clear. It prints sheets up to 13″ x 19″, making it suitable for wide format business documents. Their three-color system produces images that are accurate, and the multiple speed settings let you choose between high quality prints and speedy output. If you’re a high-volume printer, this is the first model you should look at. The Epson ET-16500 uses a unique tank system, so you won’t be changing cartridges all the time. Sure, it does cost a little more up front than competing models. But once you add up your savings on ink over time, you’ll realize what a great deal this is. The included tanks are sufficient to print a total of 4,000 black and white pages or 6,500 sheets of color. Generally, you’d require 40 ink cartridges to accomplish the same thing. At $20 a pop, costs can add up quickly. But with the ET-16500, you can accomplish all of this printing with a $50 bottle of ink. All four colors are refillable, potentially giving you an entire year’s worth of printing without having to change cartridges. This printer has a huge paper tray, allowing you to print up to 100 sheets at a time. In black and white, everything is printed at a zippy 18 pages per minute. In color, you can still get 10 pages per minute out of it. Since you don’t have to change cartridges, you’ll save plenty of time in between prints. Which Wide-Format Printer Should I Own? Each of these wide-format printers are suitable for a different purpose. Depending on how it will be used, some may function better than others. For most office users, the HP Officejet Pro 7740 will meet all of your needs. It’s easy to set up, has a number of different features, and is compatible with all major printing sources. Because it supports fax, scanning, and copying, this all-in-one unit should handle all of your business printing needs with ease. 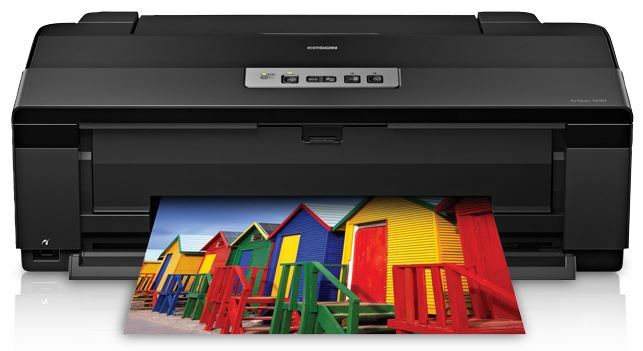 If you’re looking for a printer that can produce professional quality photographic prints, then the Epson Artisan 1430 is a sure bet. 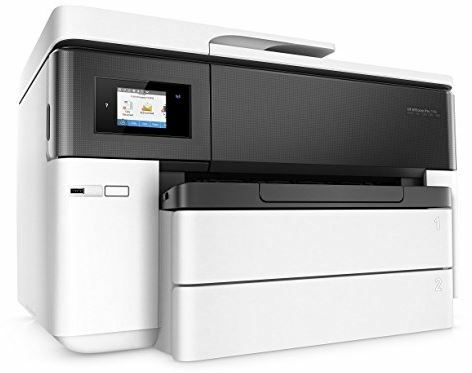 This printer handles the largest size prints and the highest quality, allowing you to produce professional documents from the comfort of your office. If you’re printing upwards of 1500 pages per year, the Epson ET-16500 will save you lots of money. Sure, the printer is a little more expensive up front. But just a single tank of ink will compensate for the initial purchase price. This is the only high volume inkjet that we are happy to recommend.